A big-rig temporarily blocked both directions of the San Mateo Bridge early Tuesday, according to the California Highway Patrol. Mike Inouye and Bob Redell reports. A big-rig fire temporarily blocked both lanes of the San Mateo Bridge early Tuesday, according to the California Highway Patrol. 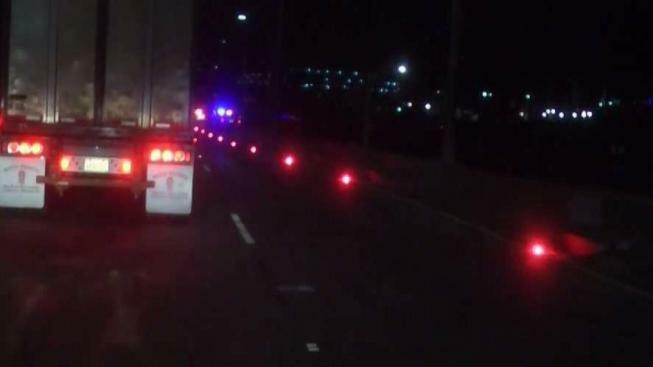 The big-rig was resting off the bridge just east of Foster City Boulevard, but the incident, which was called in at 3:24 a.m., forced officials to close both sides of the bridge at 3:34 a.m., according to officials. Eastbound lanes were reopened at 4:07 a.m., according to officials. Westbound lanes were completely reopened just after 5 a.m.
No injuries were reported, according to officials. The big-rig was hauling food products, but it is not clear what exactly was in the trailer. A big-rig fire temporarily blocked both directions of the San Mateo Bridge early Tuesday, according to the California Highway Patrol.